Over the past few years I have developed a wonderful working relationship with the folks at RM Palmer Company in which they send along their holiday offering for me to sample with the girls and create fun desserts and crafts with. Unfortunately due to a family emergency last year, I wasn't able to participate. But, I was excited when they reached out this year, and couldn't wait to receive samples to share with the girls. I am not sure who was more excited when the box from RM Palmer arrived at the door, the girls or myself. While they didn't know what was inside, I sure did, and being a chocolate lover, couldn't wait to see what fun and oh so tasty Easter treats were inside. 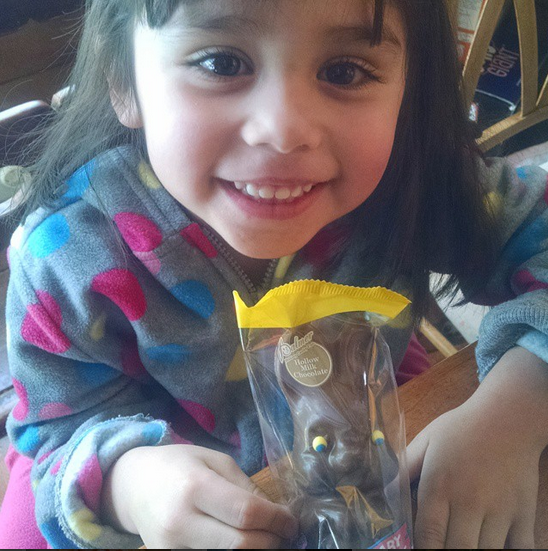 Both of my girls were quick to grab the Baby Binks, which has become a staple in their Easter baskets. Another favorite RM Palmer treat that I had picked up for my girls last Easter and that was included in the box of goodies this year was their Fun'n Games chocolate puzzle. Who doesn't love ducks, especially cute little ones? 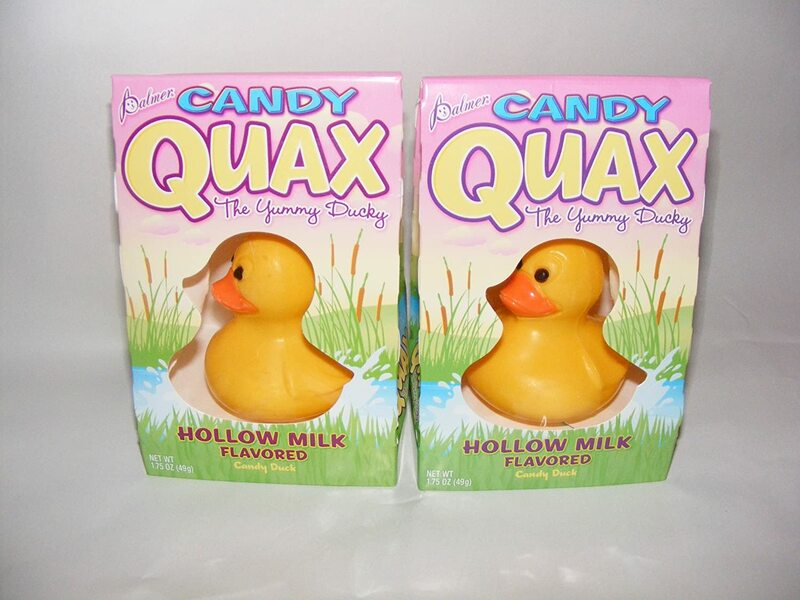 Well, the folks at RM Palmer Company have you covered with their fun Quax duck, which is made of pure milk chocolate. It is hollow, and will crumble once you take a bite. But, don't worry as you will still love nibbling away at this. My girls were reluctant to eat their Quax, but after holding it and playing around with it too much, it began to melt, or so they said...so, they had to eat it. Boy, were their bellies happy, and they had a grin on their face as they told me they ate the little yellow duck (by accident). 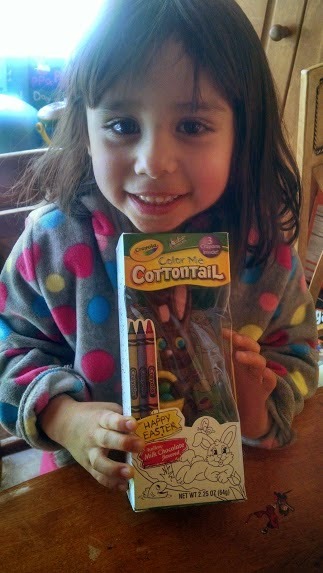 I was excited to find the Color Me Cottontail chocolate bunny in the box of goodies sent for the girls. The only difference with this box filled with an Easter-themed milk chocolate bunny, is that your child gets to color the outside packaging with crayons. 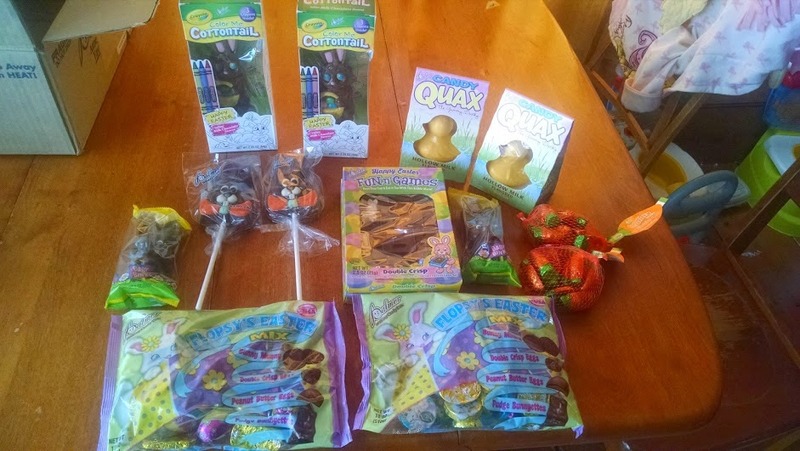 Other fun goodies that were included in our RM Palmer Easter sweets box were mesh bags of carrots, which the girls and I plan to use to decorate cupcakes for Savannah's upcoming Easter party at school -- stay tuned for photos I will share on my social media pages, as well as 18 oz. 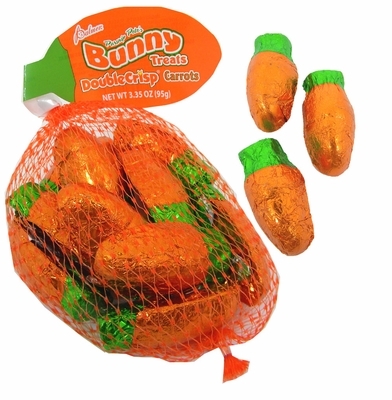 bags of Easter mix (which included milk chocolate and peanut butter foil wrapped candies) and my personal favorite, 3 oz. 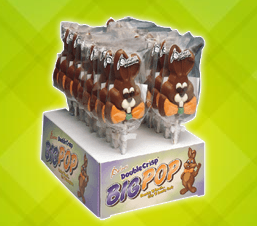 bags of Double Crisp Bunny pops. I kept asking the girls if they would share their bunny pop with me. Is your child having an Easter party at school, or do you just love going all up making fun sweets for family and friends to enjoy at your Easter dinner? 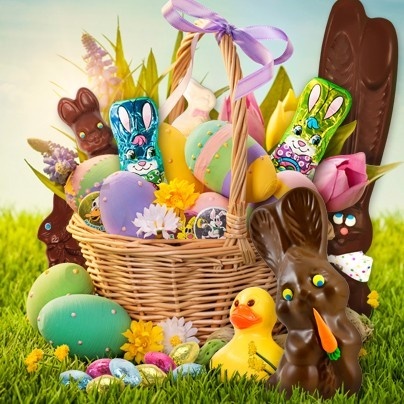 Why not pick up some of the above RM Palmer Company Easter chocolates I mentioned above to make your dessert table extra playful, and one guests will hover over, trying to sample all the tasty treats you and your children make. Here are just a few of the recipes I found when browsing the RM Palmer Company site and will be making for our upcoming Easter brunch with family at my house. I can't wait to hear what guests think of them. Easter Egg Nests -- Only Costs $9 for all ingredients to make 16 servings. My girls want to add licorice to make them look like cute little Easter baskets, too! How cute are these Easter Basket Cupcakes? These are going to be a definite at our dessert table and at Savannah's school party. They look too cute to eat! And, I sure can't wait to get into the kitchen with the girls to make these tasty treats, as well as think of fun arts and crafts products to add these chocolates to -- thinking Easter bunny village or cute carrot patch scene that will act as a chocolate advent calendar to count down the days until Easter. 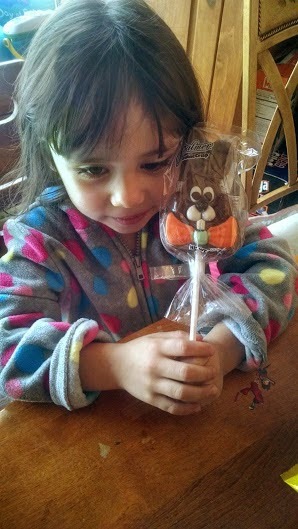 :-) Savannah already picked out the Easter Candy Cones craft idea that she saw when browsing the Palmer site, as a fun way to hand out her Easter candy to her class. And, I am hoping to do this fun egg carton craft with the girls I saw on their site -- super cute! To learn more about the chocolates I mentioned above, as well as other seasonal chocolate novelties available for this Easter season, visit www.rmpalmer.com. And, while you are there, don't forget to check out the fun stuff you can do with Palmer chocolate -- including games, recipes, crafts and more. Each year, R.M. 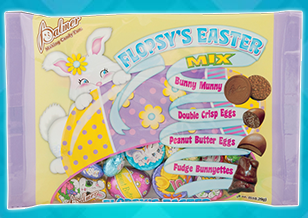 Palmer Co. manufactures 50 million hollow Easter bunnies in our facilities in Reading, Pennsylvania. Palmer’s products are available at grocery stores, discount stores, drug stores and other retail outlets throughout the U.S.
R.M. Palmer Company has been crafting fun, seasonal chocolate novelties since 1948. Today, the R.M. Palmer Company is the 75th largest confectioner in the world, with more than $165 million in annual sales, and is the 21st largest confectioner in North America (according tocandyindustry.com). For more information about R.M. Palmer Company, visit www.rmpalmer.com.